I just let Angel plant handfuls of nasturtium seeds last week from a bunch of leftover seed packets…maybe the rabbits will leave them alone. Do you put them in salads, or just enjoy the colors? I always plant some Nasturtiums. When the kids were little I would put a blossom on their plates and tell them it was dessert! I plant mine right in the sun. I used to only plant them in containers or window boxes, until I visited a lovely garden a few years back. She had them planted in her flower beds, and I love how they just filled in and meandered around the edges. I found a variety Peaches and Cream this year and it has beautiful green and white leaves. No flowers yet tho. Hope you and Angel have lots of blossoms! The first time Hubby and I went to Giverney to see Monet’s gardens, he took one look at at the nasturtiums trailing across the paths and said, ” Can WE do that?” I laughed, wondering exactly what he meant by “we”… I have them somewhere in the gardens every year. They’re great companions for thepole beans. Wow, you have been to Monet’s gardens! How amazing! Edibles 🙂 – do you eat them? Think I must find some of these – they really are pretty. So easy to grow from seed, just push them into the soil! Both the leaves and flowers are edible. I don’t find the flowers to have a lot of flavor, but oh so pretty to top a salad, or plain old frosted cupcake! The leaves are slightly peppery! 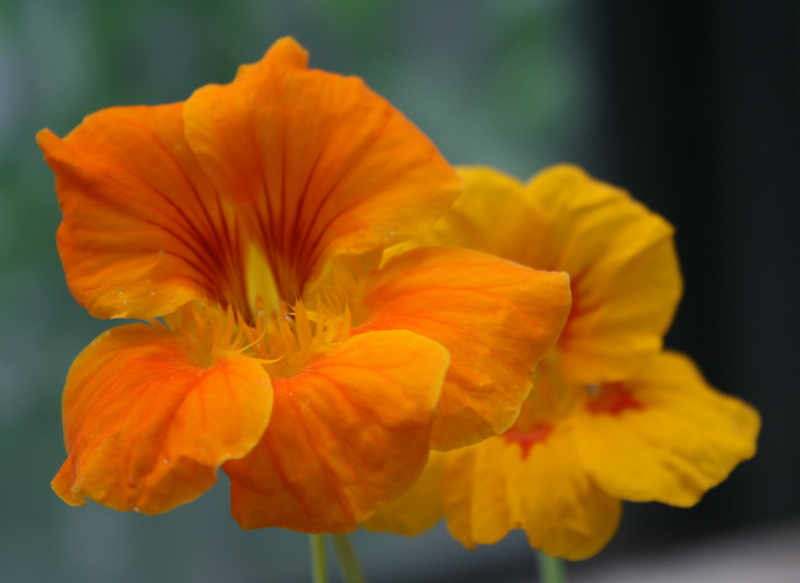 I saw Martha Stewart once put a tiny scoop of raspberry and orange sherbert onto a leave of Nasturtium. It was so pretty–never done it, but so remember it!! Funny! Great ideas – love the cupcake one.